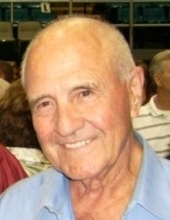 On Friday, March 29, 2019, James Robert “Bob” Stephens was called to his heavenly home. He was born on November 19, 1928, in Sullivan's Hollow, MS. He is survived by his three daughters, Debra Wood (Robby) of Laurel, Michelle Dobbe (David) of Vancleave, Tracy Martin (Johnny) of Cumbest Bluff; grandchildren, Melanie Stephens (Jeremy), McKenzie Walters (Jimmy), Katie McMurray, Abby McMurray, Angela Salamone (Patrick), Laura Bosarge (Trey), Wesley Dobbe (Melissa), Brittney Barton, Stephen Martin, Zachary Martin, and Alexis Stephens. He was also blessed with 17 great-grandchildren. The family would like to thank Hospice of Light and special family friend, Michelle Vinson, for the compassion shown to our family through the years. The visitation will be held Monday, April 1, 2019, from 3:30 p.m. until 4:30 p.m. at Heritage Funeral Home in Moss Point, MS. The funeral service will immediately follow in the funeral home chapel with Bro. Jim Kirkendall officiating. Entombment will be held at Machpelah Cemetery in Pascagoula, MS. Pallbearers will be Stephen Martin, Zachary Martin, Wesley Dobbe, Jeremy Stephens, Jimmy Walters, and Austin Stafford. Honorary pallbearers will be Robby Wood and Jim Kelly. To send flowers or a remembrance gift to the family of James Robert "Bob" Stephens, please visit our Tribute Store. "Email Address" would like to share the life celebration of James Robert "Bob" Stephens. Click on the "link" to go to share a favorite memory or leave a condolence message for the family.